Mugig Sound Bar Realistic Surround Sound, brings you perfect listening enjoyment. - You can also adjust the playback settings by remote control,there has tweeter with bass sound. Products we sell can be changed and refunded in six months. We will try our best to solve the problems as soon as possible. Work with the speaker by BLUETOOTH or the WIRED connected by USB,TF card, audio player coaxial line, fiber optic cable, 3.5mm AUX audio cable. Different ways to place: Wall-mounted in 1 or placed separately. 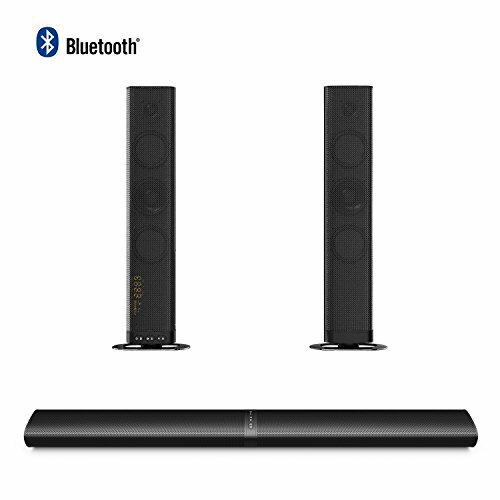 External subwoofer function sound bar has passed FCC / CE / ROSH / UL certification. Dual operation modes: Key control or Remote Control for television, computers, mobile phnes, game consoles, projectors, DVD using. Multifunction sound bar with modern design, suits any home adding a modern and high tech touch. All Mugig sound bar after-sales service covered. 2.0 Channel and 8 speakers(2 Tweeters, 2 Deep Bass, 4 Full Range Speakers), 21 inch each part of Sound bar(42 inch Combined), Surround Sound Subwoofer with Crystal Clear Audio. If you have any questions about this product by Mugig, contact us by completing and submitting the form below. If you are looking for a specif part number, please include it with your message.